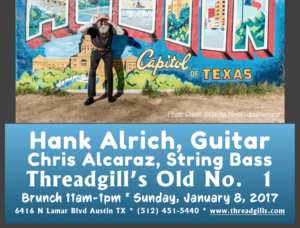 Threadgill’s Old No. 1, AKA Threadgill’s North, is the original site of Kenneth Threadgill’s gas station, restaurant, beverage outpost, and more, going back to 1933. Lately the venerable venue has opened its traditionally ‘bluegrasss’ brunch to Gospel Brunch with Jon Emery, and Jazz Brunch with the Austin Jazz Workshop. Hank Alrich enjoys playing several styles of music, a pursuit for which he has a worthy team mate in bassist Chris Alcaraz. This early January brunch musical offering promises to be casually entertaining, with enough kick to get an early January Sunday up and running.